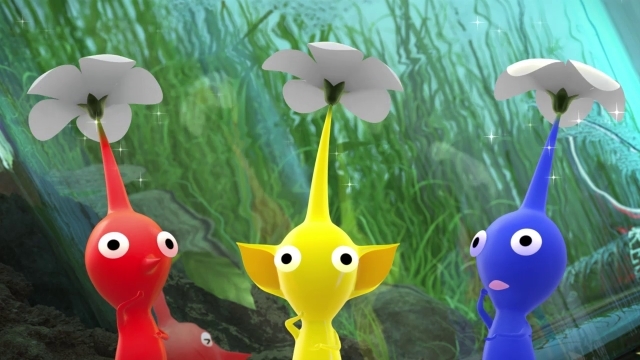 The Pikmin are curious creatures – seemingly part animal and part plant, with leaves and flowers that sprout from the tops of their heads. They spend their days roaming around their planet, hunting for treasure with Captain Olimar, a space explorer who originally arrived as an unexpected guest. The Pikmin are usually only encountered in the realm of video games, but on this occasion they have been plucked from their natural environment and thrown into the world of computer animation! They’re starring in three short movies: in “The Night Juicer”, we see Captain Olimar preparing his favourite drink, in “Treasure in a Bottle” the Pikmin encounter a most peculiar treasure, and in the grand spectacle of “Occupational Hazards”, we watch as the Pikmin deal with some very perilous work conditions on a building site. All three movies can be enjoyed in either 3D or 2D! The Pikmin are curious creatures – seemingly part animal and part plant, with leaves and flowers that sprout from the tops of their heads. Please Note: The Nintendo 3DS and Wii U versions of the PIKMIN Short Movies are identical in terms of content.